As I write this, I hear the sound of jets departing the Penticton airport. If you live in a big city, that might not sound like a big deal. But here in Penticton – where the biggest commercial aircraft that serves the city nowadays is a Dash-8 – the sound of jets is something special… especially when it’s the sound of the Canadian Forces Snowbirds in formation. 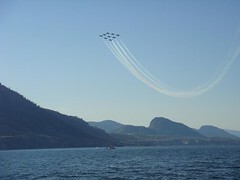 The Snowbirds opened the 2008 Penticton Peach Festival this evening at 6PM with a wonderful performance. The show that ran primarily east to west just north of the south shore of Okanagan Lake and between Munson Mountain and Red Wing Estates was particularly tight. The folks viewing from Munson mountain probably had the most fun as the Snowbirds raced directly overhead at low level. Woohoo! We met up with most of the ‘gang’ from our street at Marina Way Park just slightly off center showline. 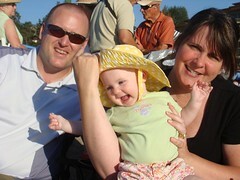 This was Lulu’s first airshow and evidently, from the look on her face (see picture to the right), she thought it was awesome! Unfortunately, it appeared that one of the aircraft went unserviceable during the second half of the show, so they completed the act with only 8 airplanes. But, as always, the show was absolutely terrific – thanks guys!